Wi-Fi (802.11a/b/g/n), Near-Far 2D Imager, Windows Embedded 6.5, 256MB RAM/1GB Flash, Numeric Keypad, Bluetooth. Includes battery and ICP application software. Interface cables and charging cradle sold separately. Spare Battery (Part# 318-033-021). Quad charging dock (Part# 871-230-101). Requires Power supply (Part# 851-810-002) and AC power cord (Part# 1-974028-025). Wi-Fi (802.11a/b/g/n), 2D Imager, Windows Embedded 6.5, 256MB RAM/1GB Flash, Numeric Keypad, Bluetooth. Includes battery. Interface cables and charging cradle sold separately. Spare Battery (Part# 318-033-021). Quad charging dock (Part# 871-230-101). Requires Power supply (Part# 851-810-002) and AC power cord (Part# 1-974028-025). Wi-Fi (802.11a/b/g/n), 2D Imager, Windows Embedded 6.5, 256MB RAM/1GB Flash, Numeric Keypad, Bluetooth. Includes battery and ICP application software. Interface cables and charging cradle sold separately. Spare Battery (Part# 318-033-021). Quad charging dock (Part# 871-230-101). Requires Power supply (Part# 851-810-002) and AC power cord (Part# 1-974028-025). Wi-Fi (802.11a/b/g/n), Near-Far 2D Imager, Windows Embedded 6.5, 256MB RAM/1GB Flash, Numeric Keypad, Bluetooth. Includes battery. Interface cables and charging cradle sold separately. Spare Battery (Part# 318-033-021). Quad charging dock (Part# 871-230-101). Requires Power supply (Part# 851-810-002) and AC power cord (Part# 1-974028-025). 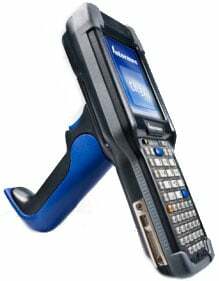 Wi-Fi (80211a/b/g/n), Near-Far 2D Imager, Windows Embedded 65, 256MB RAM/1GB Flash, Numeric Keypad, Non-Incendive, Bluetooth Includes Battery And ICP application software. Interface Cables And Charging Cradle Sold Separately. Wi-Fi (802.11a/b/g/n), Near-Far 2D Imager, Windows Embedded 6.5, 256MB RAM/1GB Flash, Numeric Keypad, Non-Incendive, Bluetooth. Includes battery. Interface cables and charging cradle sold separately. Wi-Fi (802.11a/b/g/n), 2D Imager, Windows Embedded 6.5, 256MB RAM/1GB Flash, Numeric Keypad, Non-Incendive, Bluetooth. Includes battery. Interface cables and charging cradle sold separately. Wi-Fi (80211a/b/g/n), 2D Imager, Windows Embedded 65, 256MB RAM/1GB Flash, Numeric Keypad, Non-Incendive, Bluetooth Includes Battery. Interface Cables And Charging Cradle Sold Separately. CHINESE VERSION. Wi-Fi (802.11a/b/g/n), Near-Far 2D Imager, Windows Embedded 6.5, 256MB RAM/1GB Flash, Chinese Alphanumeric Keypad, Bluetooth. Includes battery and ICP application software. Interface cables and charging cradle sold separately. Spare Battery (Part# 318-033-021). Quad charging dock (Part# 871-230-101). Requires Power supply (Part# 851-810-002) and AC power cord (Part# 1-974028-025). Wi-Fi (80211a/b/g/n), Near-Far 2D Imager, Windows Embedded 65, 256MB RAM/1GB Flash, AlphaNumeric Keypad, Non-Incedive, Bluetooth Includes Battery And ICP application software. Interface Cables And Charging Cradle Sold Separately.